SEOUL, Korea, Republic Of -- North Korean leader Kim Jong Un likely decided to put his nuclear weapons program up for negotiation to win outside rewards so he can improve his country's economy, win public trust at home and prolong his leadership, a special adviser to the South Korean president said Tuesday. 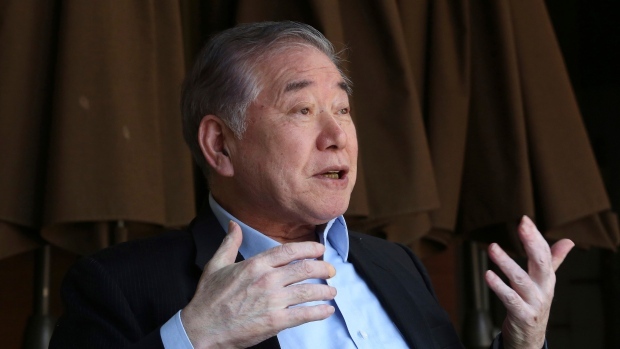 Moon Chung-in, a retired Yonsei University professor who is an adviser to President Moon Jae-in on inter-Korean and security issues, shared his assessment in an interview Tuesday with The Associated Press. Kim is to hold separate summit talks in coming weeks with the South Korean leader and U.S. President Donald Trump. After sharply raising regional tensions with a series of nuclear and missile tests last year, Kim has been reaching out to Seoul and Washington this year, prompting speculation over why he is doing so just as he appears close to achieving his objective of developing nuclear missiles capable of targeting the U.S. mainland. Some experts say harsh UN sanctions or fears of U.S. strikes could have driven Kim to initiate the peace offensive. Moon Chung-in said Kim's desire to improve livelihoods at home by developing the economy while bolstering his nuclear capacity, could be his motive for the recent outreach. Although Kim is the absolute leader in North Korea, "he still cannot survive if he fails to win the hearts and minds of his own people," Moon said. "If he fails to make his people happy, the safety of the North Korean system cannot be guaranteed. How can nuclear weapons guarantee that?" Since taking power upon the death of his dictator father in late 2011, Kim has orchestrated a series of high-profile executions, purges and dismissals to strengthen his grip on power. Under his rule, the North's economy has gradually improved with some capitalist elements allowed, such as outdoor markets. But UN sanctions that toughened after the North's nuclear and missile tests last year are feared to take a huge toll on its economy if they continue, foreign experts say. Moon Chung-in said Kim likely believes his country's recent rapid progress in its nuclear and missile programs will force the United States to the negotiating table, after Washington rejected the North's previous offers of dialogue, citing a lack of sincerity. "North Korea might have thought the U.S. won't begin a dialogue if it had incomplete nuclear and missile capabilities. So the North could have thought it should demonstrate an ICBM (intercontinental ballistic missile) capability to get the U.S. to feel a threat and come to talks," Moon Chung-in said. When South Korean special envoys visited North Korea's capital last month, Kim agreed to meet Moon Jae-in in the Koreas' third-ever leaders' summit and expressed his willingness to hold "candid" talks with the United States about "denuclearization of the Korean Peninsula." Kim also said he has no reason to possess nuclear weapons if he has a credible security guarantee and doesn't face outside military threats, according to the South Korean envoys. Kim's offer eventually led Trump to accept a summit with Kim. But critics say the North is likely to take only partial steps toward disarmament while winning various concessions, and that tensions could then flare again. They note North Korea has long said that "denuclearization of the Korean Peninsula" should also include the withdrawal of the 28,500 U.S. troops in South Korea and a halt to annual U.S.-South Korean military exercises. Moon Chung-in said North Korea this time knows it cannot reach a breakthrough deal with the United States unless it accepts American calls for complete, verifiable and irrevocable steps toward disarmament. He suggested that prospects for nuclear diplomacy would largely depend on what kinds of rewards the United States can offer to the North in return and whether the North will repeat its previous big demands such as the withdrawal of the U.S. troops in South Korea. On Tuesday, South Korean presidential chief of staff Im Jong-seok said it is critically important to get the North Korean leader to confirm his commitment to denuclearization during the April 27 inter-Korean summit. Im told reporters that the inter-Korean meeting could be a "cautious starting point" for efforts aimed at the "complete denuclearization or establishment of permanent peace," while using such developments to achieve a dramatic improvement in North Korea's relations with the United States, South Korea and other nations in the region.